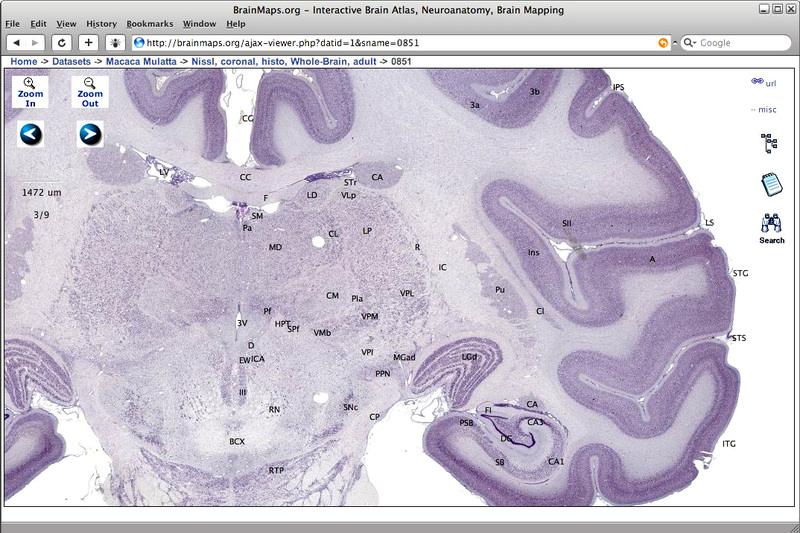 BrainMaps.org, launched in May 2005, is an interactive, multiresolution next-generation brain atlas that is based on over 140 million megapixels of sub-micron resolution, annotated, scanned images of serial sections of both primate and non-primate brains and that is integrated with a high-speed database for querying and retrieving data about brain structure and function over the internet. 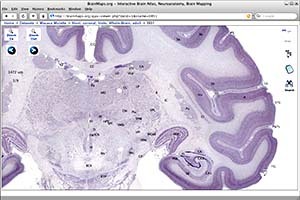 Currently featured are complete brain atlas data sets for various species, including Macaca mulatta, Chlorocebus aethiops, Felis catus, Mus musculus, Rattus norvegicus, Tyto alba, and many other vertebrates. Remembrances of the late Ted Jones, our good friend and colleague, may be found here. A press release is here. We have chosen to honor his memory with the Ted Jones Microscopy Lab. Certain features and functionality may be unavailable when using older versions of Internet Explorer. If you experience any problems, please contact us at either wmusrey (at) ucdavis.edu or jsjohnson (at) ucdavis.edu. We suggest the latest stable version of Firefox. If this is your first time here, you may want to read our Help Guide or view some Screenshots before getting started.